Muddy says: Jump in, drive off and park up by the beach, in the woods, in the hills – wherever. Then just press a button or two and you’re set up for the night. 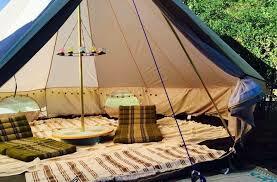 You’ll never want to sleep in a tent again. 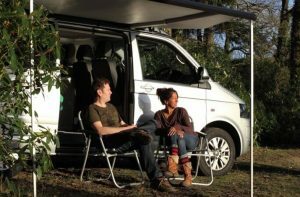 Whether you’re planning a special weekend or a European road trip, experience the freedom of self-drive VW California campervan hire tailored just for you. 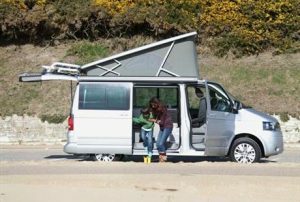 Our entire fleet is the VW T6 California Ocean. They’re super fuel efficient, a dream to drive and packed with every home comfort including a 42 litre fridge, stainless steel sink, fresh running water, twin burner hob, thermostatic controlled heating to keep you snug, oodles of clever storage – even a bluetooth digital stereo. To create your perfect holiday, we can provide gourmet cookware and ingredients for foodies, activity packs for families and for glamping queens, how about a bell tent with a hand-painted Indian table, rustic chandelier, Thai bed cushions and fairylights? 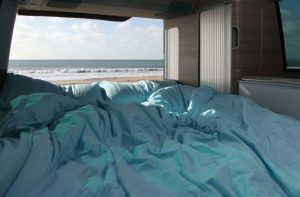 Our campervans sleep 4 comfortably. The heated front seats swivel round. The reclining rear bench seat slides on a rail system from practical driving position, to homely living space and then cosy bedroom. At the push of a button on a central control panel, the pop-up roof glides into position unveiling a spacious bedroom with a view. Included as standard: satnav, 24-hour Breakdown Cover and Recover, fully comprehensive insurance (liability & collision US) and up to two named drivers. 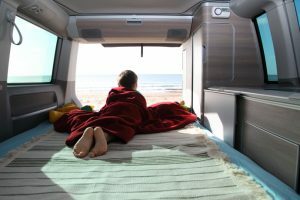 Optional upgrades include European travel, cycle rack, glamping, hotel quality bedding and more. Don’t delay, start planning your next adventure today.